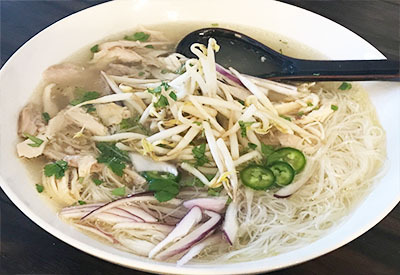 I can still remember the first time that I tasted Chicken Pho. I was walking through an international market in a large city and saw a long line of people waiting to order from one of the booths. 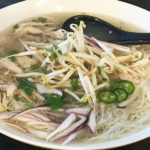 Instant Pot Chicken Pho – tastes like it has been cooking all day! I was curious about what was so good about this restaurant that so many people were willing to spend over a half an hour in line. Then I noticed everyone carrying large bowls of what looked like chicken soup topped with bean sprouts and basil leaves. I finally asked a patron that was still patiently standing in line what everyone was ordering, and that is when I first heard the words Chicken Pho. 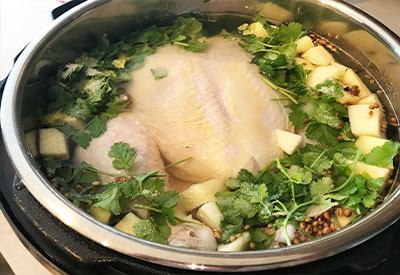 Instant Pot Chicken Pho spices – true authentic flavor. Because I had the day off work, I filed in line behind everyone else to see what the fuss was all about. And I am sure glad that I did!!! Chicken Pho is now the first thing I order when I head to a Vietnamese restaurant. Lucky for me, I found a restaurant that was only a few miles away from my house that served the absolute most delicious Pho around. For years I would head there for a quick lunch. Whenever I wasn’t feeling well, this was my new go-to chicken noodle soup meal. That was until one day, the family that owned the restaurant decided to close up shop and move to a different city. Add just enough water to barely cover the chicken breast. I was heartbroken, literally heartbroken. I was fortunate enough to have gotten to know the family very well and learned a lot about making Chicken Pho from the best. After a few attempts and several hours spent over a hot pot on the stove, I was able to replicate the recipe. However, because it took hours to prepare, I rarely made it. That was until I found another love, my 6 quart duo Instant Pot! Because my Instant Pot had saved me so much time with other recipes, I decided to give Instant Pot Chicken Pho a try. Strain the broth to remove the spices and any remaining chicken pieces. Making it in the Instant Pot saved me so much time and the flavors tasted like it has been cooking all day! So Instant Pot Chicken Pho has been a recipe that I now make 3 or 4 times a month! Delicious Vietnamese Chicken Pho made in the Instant Pot. Remove chicken from the package and remove the inner bag and discard. Rinse the chicken with cool water and set aside to drain. Place Instant Pot on Sauté mode. Once it reads HOT, put in the coriander and cloves and toast for 4-5 minutes, stirring occasionally and until fragrant. Add the ginger and onion. Stir for 2 minutes. Turn Instant Pot off. Add 4 cups of water the pot and scrape the bottom of the liner to remove any bits that stuck. Place the chicken, breast side up inside the liner. Add the apple, cilantro, salt, and the remaining 3 cups of water to the pot. Add additional water if needed so that the top of the chicken is barely covered. Place the lid on and put lever in sealing position. Pressure cook/manual on High Pressure for 15 minutes. When cooking time is over, turn off the Keep Warm setting (or unplug) to allow for natural pressure release. Use tongs to transfer chicken to a shallow baking pan and let cool. 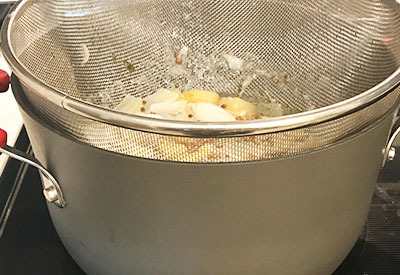 Strain liquid in a fine mesh strainer positioned over a medium pot and to the remaining broth add salt, pepper and fish sauce. Shred approximately 3 cups of the chicken meat for the pho assembly. Heat broth to a simmer. Prepare rice noodles per package instructions and divide among 4 soup bowls. Divide shredded chicken among the bowls. Top the chicken and noodles with sliced onion, green onion, cilantro, and jalapeno. Ladle 2 cups of broth in each bowl and top with optional ingredients as desired. How many pounds is the chicken? 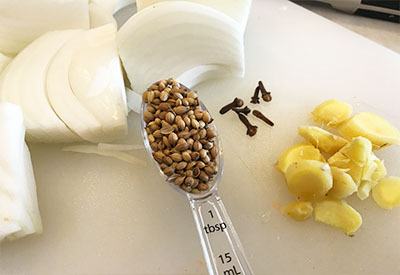 In the list of ingredients, is that 6 garlic cloves, since garlic is shown in one of the pictures? Hi Wilma – it is actually 6 whole cloves (the spice). What is pictured is peeled and cut ginger. There is no garlic in this recipe. Hope that helps!